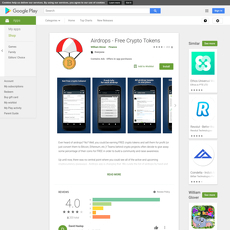 9+ Cryptocurrency Airdrop - Cryptolinks - The World's Best Cryptocurrency Sites List! Cryptocurrency seems to be the latest in the economy world. All and sundry irrespective of the age, race and color are gradually getting to know more about crypto, how it works and how best to invest. More investors are trooping into this digital system, which keeps growing, geometrically with each passing moment in order to get the best out of the best currencies in the world today. Trading in this system involves the buying of currencies at prices that traders think could be favorable and selling them off when the market value rises to ensure that they make lots and loads of profits. This is where airdrops come in. In the crypto community, blockchain projects could give free tokens or coins. This is known as crypto airdrop. If an investor will be a recipient of this project, the necessary requirement is that such an investor has coins from a relevant blockchain stored and secured in a wallet. The free tokens of coins gotten at a point in time could worth so much more at another time. 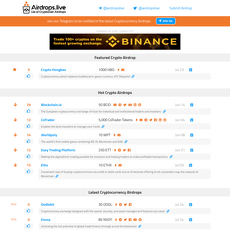 Over time, some crypto airdrops have been ranked among the best. Therefore if you’re looking to get honest reviews about top crypto airdrops, then you’re at the right place. About eight crypto airdrops have been tested to be reliable and very effective for use by the general crypto populace. You’ll also get to know about the advantages and drawbacks associated with using these 8 sites so as to help you make the a better decision on the ones that will best serve your needs. 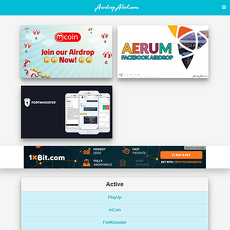 The platforms are ICO Drops, Gift.ONE, Airdrop alert, Coin Airdrops, Airdrops.live, AirdropsMe, Airdrops-free Crypto Tokens and r/CryptoAirdrop. Here, beginners, investors and enthusiasts can get accurate information about new and upcoming coins in the market and obtaining free tokens or coins. 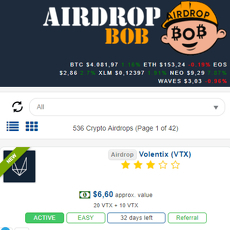 These airdrops have been named as best among the rest because of the outstanding and distinguishing features and that’s the basis on which they have been thoroughly reviewed for you. All the platforms ranked as best all provide accurate and reliable information. They focus on showing the investors what is happening at an instant. They are the best place to find the most updated and recent information. They are popularly in connection with social media outlets such as Telegram, Twitter and YouTube channels to ensure being up-to-date with posted information. Some send push notifications every time the curated list is updated as long as the investor is with the android device securely connected to the Internet. This is because they have been designed to provide education about the crypto community and to keep up with the updated list of airdrops. The platforms also provide people with an immediate and comprehensive user guide with detailed description of what airdrops stand for, how they can be obtained in the crypto community and the various methods of secured storage. There is also a list of both past, present and current projects where one can claim free cryptocurrencies. They contain hot lists, which makes them really outstanding. This also makes them great places to start if one is in a hurry or newly introduced to the airdrop scene. 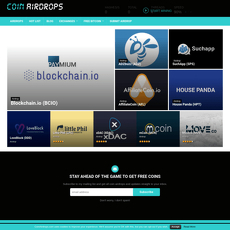 These airdrops are great sites to obtain and acquire information on projects that have not been thoroughly explained by the mainstream media or information about projects that are not easily accessible with the use of general search terms. The platforms are also suitable for airdrop and crypto enthusiasts to comment and discuss airdrops with one another. These platforms are pretty easy to use and navigate. 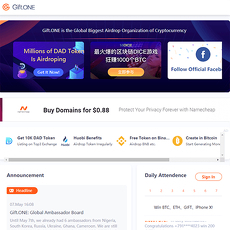 Once a site is entered, one would immediately find either at the bottom or front of the home pages, helpful guides and teaching that aims at teaching readers on the knowhow and operations of a crypto airdrop. It is easy to understand its information, which is well written, outlines and covers many of all the basics and every other thing needed to get started with airdrops. They are easy to use, simple and straight to the point services. They contain readily available and easily understandable answers to frequently asked questions. They also contain important information for new participants to help them navigate through the platform easily. Some of these platforms actually encourage users by giving out free gift tokens to them when they invite and register friends. They also provide daily giveaways for daily attendance rewards. Upon each visit to the site, users are rewarded with daily giveaways. 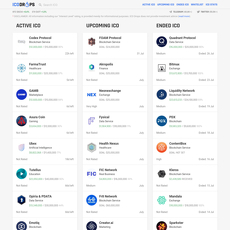 Some of the platforms actually uniquely sorts projects by their respective exchange sites. 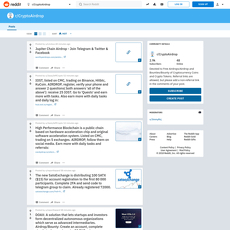 The sorting by application method is highly effective because some users are more comfortable with certain methods when compared with some other methods. This means that the platforms are flexible and they offer flexible methods.